Each scoop 100% natural drink mix includes your daily dose of vegetables plus the added benefits of natural energizers and organic grasses. All Day Energy Greens® is a powerful superfood easily digestible and allows your body to absorb the vitamins and minerals completely and quickly as a whole food, not just a supplement. 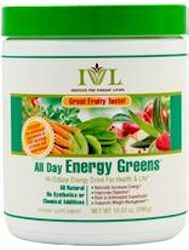 Each scoop includes your daily dose of vegetables plus the added benefits of natural and energizers. Yes, that is 5 servings of vegetables and fruit in one tablespoon. Better yet, it has less calories and carbs than if you ate all those veggies and fruits! The blend of essential vitamins, vegetable, grasses and energy herbs are of high quality ingredients. Compared to most green drink powders, it tastes good. The daily serving cost is less than $1.40. Offers a great comprehensive list of available superfoods compared to the competition. ADEG dissolves well in liquids lessening the gritty taste compared with similar products. Similar products in capsule form require up to 6 pills a day. Complete antioxidant and amino acid support. 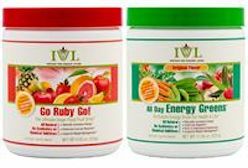 IVL offers Zing, an allergen-free option; however it is not gluten-free. Super Wheatgrass Combo is gluten-free. Backed up by medical doctor Devin Mikles. As with many powders, the ingredients are listed in proprietary amounts. With research, I get conflicting information if it does contain probiotics or not. This isn't a good product for people sensitive to caffeine due to the green tea extract. I personally didn't lose weight; but others have reported losing weight. If you are looking for a meal replacement, look elsewhere.